Unwind, relax, rejuvenate - these words just invoke a sense of relaxation in your mind right? The surprising thing though, is that I feel like with the life that we are leading, I want to rejuvenate and relax every other day. A spa THAT often might be a bit of a hassle (time and money is DEFINITELY a factor to consider here). So, I found a fool-proof way to wash the day off, with a luxurious bath right at home! I am a sucker for warm baths after a long day. Throw in a body scrub, add some bubbles, light up a scented candle and it’s an impromptu set up for quality alone time or with your partner! Coming right up is a list of bath essentials to relax your mind, body and soul. Pump up the romance with this set of candles. With fragrances like vanilla caramel, English rose, midnight jasmine and lavender, choose a fragrance to take your relaxation to the next level! Boost your mood with a combo of bergamot, orange and lemon essential oils. Use it in your bath water, or it to your diffuser! Add some lavender bath salts to your bath water to calm yourself and soothe any sore aching muscles. Lavender promotes a restful sleep and an unmatched sense of calm! If that’s not all, it’s great for your skin too. Add a fizzy bath bomb to your bath water and rejuvenate as you see it unfurl! A treat for the senses, sit back with a glass of Pinot Noir and soak it all up. This exotic scrub is enriched with cocoa butter and raw cane sugar that helps get rid of dead skin cells. Not only does it exfoliate, but it also makes you smell of Tiramisu. Good luck not wanting to eat this! This refreshing shower gel has a blend of herbs, spices and fruits that helps you clean up and also helps you feel refreshed. Since it’s light and washes off easily, it can be a bath-time staple! This soap has pure red sandalwood powder and oil to help with issues like acne, sunburn, and blemishes. Use it once, and watch your skin glow! It will fade your tan and control your skin’s oil production. Don’t forget to moisturise after you use this. Slather on this comforting body lotion to hit the snooze button. Lavender helps promote restful sleep and moisturises and nourishes any dull, tired skin. Finding inner peace couldn’t get easier! 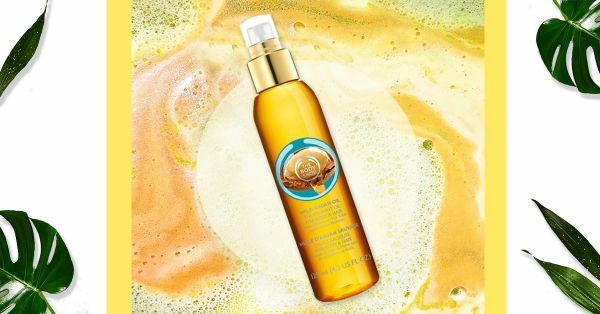 The Body Shop Wild Argan Oil is a dry oil that can be used on both your skin and hair. Not just good for your hair, Moroccan oil helps your skin glow, heal and rejuvenate too. You might be slightly confused here, moroccan oil and argan oil are basically the same thing. Moroccan oil is a more refined/modified version of argan oil. This body oil smells like your floral fantasy. It has the goodness of almond and sesame oils to give you soft, radiant and glowing skin! Since it’s lightweight, your body absorbs it instantly, without leaving your skin feeling sticky! The Spa Ceylon bath set is perfect for your next honeymoon or getaway. It smells like pure luxury and has everything you’ll ever need for a sensual bath experience. These bath products will invoke a sense of inner peace, maybe momentarily until life takes over! But they’re totally worth that 30 minutes of pleasure. Go ahead and indulge yourself, no regrets!